Jess Lovi d/b/a American Differential Antique Tractors, Trucks and Equipment Auction, Colo. Springs, Colo., (719) 336-5117, http://www.CivisAuctions.com or http://www.MHBarrAuction.com. Finney County Cropland Auction, Garden City, Kan., (800) 247-7863 or http://www.FarmAndRanchRealty.com. Absolute RE Auction, Silt, Colo., (970) 928-7100 or http://www.LippardAuctions.com. Consignment Auction, Longmont, Colo., (970) 221-4300, http://www.WWSells.com or http://www.FieldReadyAuctions.com. Ethan Ford Auction, Mitchell, Neb., (308) 436-4056 or http://www.HelbergNussAuction.com. CO Draft Horse & Equipment Auctions, Brighton, Colo., (970) 785-6282 or http://www.TroyerAuctions.com. Stenson Antique Auction, Guernsey Wyo., (307) 836-2225. Specialty Auto Auctions, Brighton, Colo., (800) 901-0022 or http://www.SAAASInc.com. Parker Estate & Moving Auction, Bailey, Colo., (303) 838-7944 or http://www.KenoshaAuctionInc.com. Glenn & Lori Muhr Auction, Harrisburg, Neb., (308) 641-5620, (308) 436-4056 or http://www.HelbergNussAuction.com. Prottsman Auction, Haxtun, Colo., (970) 774-4500, (970) 580-5312 or http://www.Knode-RealtyAuction.com. Rima Automotive Auction, Norton, Kan., (785) 877-3032. Sealey Jr. Estate Auction, Greeley, Colo., (970) 356-3943 or http://www.K-WAuctions.com. Northern Colorado Cities and Counties Well Maintained Vehhicles and Equipment Auction, Loveland, Colo., (866) 515-1668 or http://www.RollerAuction.com. Real Estate and Estate Auction, Steamboat Springs, ,Colo., (970) 260-5577 or http://www.CPAuction.com. Carl and Lorene Sullivan Estate Auction Part 2, Loveland, Colo., (970) 396-8754 or http://www.NixonAuctions.com. Large Estate Antique & Collectible Auction, Julesburg, Colo., (970) 474-3693, (970) 520-5257 or http://www.MichaelAuction.com. Labor Estate Auction, Longmont, Colo., (303) 589-4119, (303) 652-2030 or http://www.NiwotAuction.com. Estate Coin Auction, Brush, Colo., (970) 380-7653. Large Estate Coin Auction, Julesburg, Colo., (970) 474-3693, (970) 520-5257 or http://www.MichaelAuction.com. Griboval Estate Auction, Longmont, Colo., (303) 589-4119, (303) 652-2030 or http://www.NiwotAuction.com. 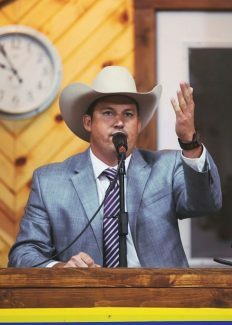 Roderick Button Moving Auction, Weldona, Colo., (970) 356-3943 or http://www.K-WAuctions.com. Mary and the Late Jim Frank Auction,, Ft. Laramie, Wyo., (307) 532-4976 or (307) 534-5156. 70th Annual Craig Ram Sale, Craig, Colo., (970) 629-8249. Rocky Mountain Shorthorn Select Sale, Keenesburg, Colo., (970) 381-9913.